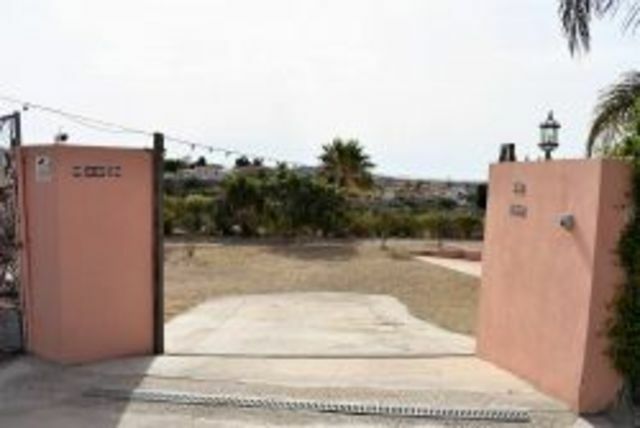 Fully renovated 2 bedroom 2 bathroom detached cortijo in La Huerta area of Antas measuring approximately 150m². Set on a plot of 979m², this unique property is packed with charm & traditional features. This unique property has great scope for further development and benefits from agricultural water rights. The cortijo is located in a small, friendly & idyllic hamlet just 5 minutes´ drive from the highly regarded town of Antas. Antas offers all daily amenities including shops, supermarkets, bars, restaurants, pharmacy, medical centre, schools, etc. The larger town of Vera is just 10-15 minutes away. The coastal resorts of Garrucha & Mojacar are 15-20 minutes away by car and major motorway links are close by. The approach to the property via good tarmac roads leads to double entrance gates. The plot is completely fenced & gated with a separately fenced off area to the right for dogs. There is plenty of off road parking and the current owners have a caravan sited on the left. Immediately on the left through the entrance gates is a large underground water irrigation tank. This property is sold with free agricultural water rights, ideal for cultivating the land. The plot is bordered by many mature trees & bushes affording great privacy, whilst the lower section of land to the front is flat and an ideal garden area. To the front of the property there is al fresco dining terrace, which is the ideal spot to enjoy the distant sea views. Traditional double doors open into a large entrance hall with extra high ceilings with exposed beams. Further double doors to the right lead into the lounge, again with feature exposed ceiling beams. Straight ahead from the hall is the fully fitted kitchen with Andaluz tiling. To your left from the kitchen is a small hallway leading to the master bedroom, family bathroom and a store cupboard. The master bedroom is a generous double with the exposed ceiling beams continuing through the whole house. Next to this is the family shower room with a huge walk-in shower. A store cupboard then faces you opposite the bedroom. Back into the kitchen and a door on the other side of the house leads to another hallway serving the second bedroom and another family shower room. There is a utility area in this hallway housing the washing machine etc. The property has been fitted with hot & cold air conditioning and boasts an electronic damp proof course. Mains water & electricity are connected along with the free agricultural water rights. Internet connection is also available.